In 1996, Marcopper Mining Corporation, 39.9 per cent owned by Canadian Placer Dome, began mining the Mount Tapian coppergold deposit on the island of Marinduque in the Philippines. 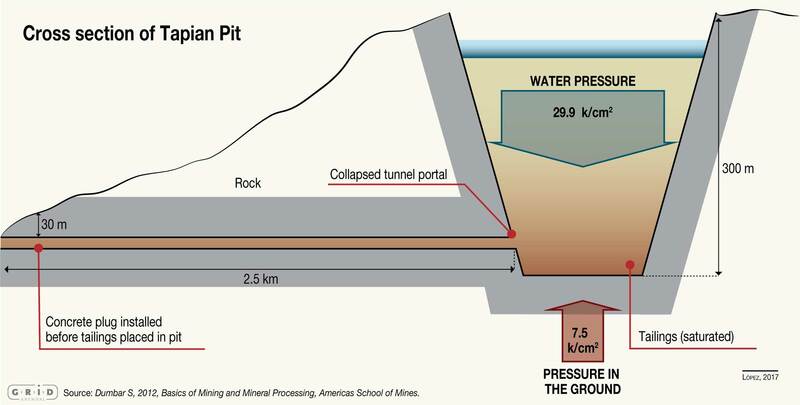 By 1990 the mine was exhausted and the company opened a second site at San Antonio, three kilometres away. Following a failed attempt to obtain permission to dispose of tailings directly into the sea, the company was granted a 10-year certificate to deposit tailings into the mined-out Tapian Pit. Tunnels that had previously been used to drain the pit were sealed with concrete to contain the tailings. On 24 March 1996, after four years of tailings disposal into the Tapian Pit, the plug in the drainage tunnel leading to the Boac River gave way, resulting in one of the most catastrophic mining disasters in history.